Maybe a full hardware port of Numerology? this popped up in the namm predictions thread, too. Ah.. I didn't see that before I posted the new thread but frankly, something from Five12 deserves a thread of it's own! I love Numerology, can't wait to hear more about this! From what I've heard, this will not only send out CV and MIDI from 2 internal, VC MonoNote-esque sequencers (with step probability, step skip, step mute, random jumps, etc.) but will also have a mode that allows CV control of the Numerology VST (via the USB jack probably) and consequently possibly also polyphonic MIDI parts And from the looks of the panel, preset storage and management will definitely be a thing. 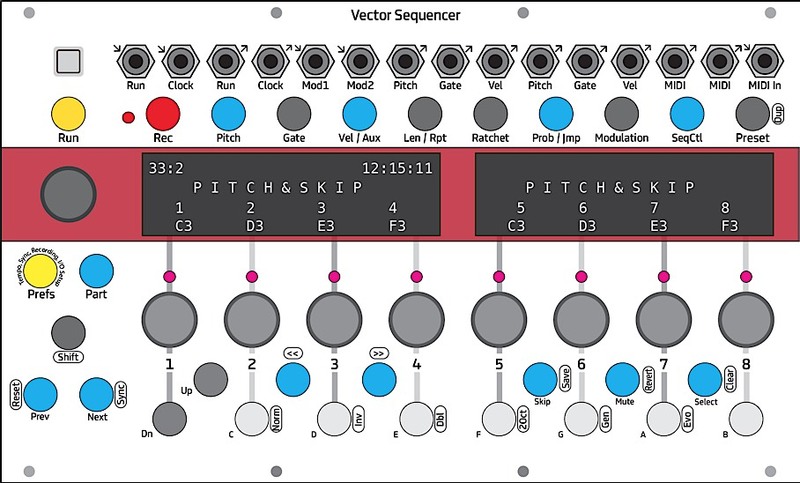 The Vector Sequencer is a digital sequencer in the Eurorack modular format. It provides a significant amount of the sequencing features you can find in the MacOS version of Numerology, including a flexible sequencing engine, sub-sequencers for internal modulation, support for multiple parts, as well as presets and a playlist function. It has enough built-in outputs to support four or more independent parts. There are two MIDI outputs on 3.5 mm TRS jacks, and two sets of analog CV outputs (Pitch, Gate and Accent), so it will integrate well with both modular gear and standalone synths. By adding some sort of jack expansion (under consideration), or by doubling parts on MIDI jacks, it will almost certainly be able to support more than 4 parts, but there would be some tradeoff with preset memory. (more on that in a bit). The UI is based around two sharp and contrasty OLED display panels, resolution is 256 x 64. Don't pay too much attention to the odd fonts in the current videos, those are just the fonts that come with the default driver code for the displays. The displays are graphically adresssable and I will be updating the layout considerably -- custom fonts and sizes, better layout, more indicators about what's going on, etc. Below the displays are 8 encoders used for editing parameters -- so you can edit one parameter across 8 sequencer steps at a time. There are next/prev buttons for accessing sequences longer than 8 steps. The current max sequence length is 16, which will be expanded later on. To the left of the displays is a ninth encoder. This can be used to edit all steps of a sequence or a selected subset of steps at a time. For instance, you could select all the odd-numbered steps and edit the gate time for them all at once. The sequencer engine (for each part) is based on the one used by Numerology's Note Sequencer modules. So for each step, you have several parameters to work with. The current list includes: Pitch, Gate, Velocity (err, Accent), Step Length, Ratchet (aka Gate Divide), Probability, and Random Jump. I expect Step Repeat, Groove, and some sort of Glide will also make it in. Sequence controls also include settable start and end step, direction, rate, key, scale and semitone offset. I plan to replace "end step" with length -- as that makes some modulation tricks (sequencer windowing) much easier. There is a dedicated button for Modulation which will bring up one or two sub-sequencers that can modulate params on each primary sequencer (per part). These sequencers will be simpler than the Mod Seqs in Numerology, but will work very similarly. They will have up to 8 steps, with params for length, rate, direction, and target param. There will be presets and some sort of preset playlist. Presets will be grouped into banks and will be loadable from an SD Card. The number of presets per bank will vary according to sequence length -- so if you need longer sequences and can get by with fewer presets, that will be a configuration option. The SD Card is currently mounted on the back of the module, with the intention that it will be mountable on your computer from the USB connection. In addition to the sequenced parts, there will be at least a couple "controller" based parts. When they are active, the unit will act as a MIDI controller, either for Numerology (via USB MIDI) or for some other device -- say for other software, or a synth like the DSI Tetra which doesn't have many front panel controls. Of course, there will be a custom controller template in Numerology for it. Synchronization of various sorts will be supported: External clock (w/ divisions), MIDI Clock (master and slave), and DIN Sync through either a port expander or something like the STG Soundlabs Time Buffer. The run & clock jacks on the front panel will be configurable so that you can use them to generate clocks with any common time divisions. There are two modulation inputs for external modulation sources. The module width is 42 hp and is quite shallow -- will measure next time I have it out of the case. I have one prototype built, and a couple more are in progress for testing. I'm currently working on code to support the USB port (MIDI and Mass Storage), the SD Card, and fleshing out features like presets and sub-sequencers. More news as I have it. Questions and comments, as always, are most welcome! Don't have the Numerology yet but this thing makes a lot of sense to me. Definitely interested. I love it but really want quad cv outputs. 2 doesn't make that much sense to me. I recall Jim saying something about a possible "expander module"? Maybe it was in one of the NAMM videos? I agree more CV channels would be better. Not sure how much bigger hp-wise it'd have to get to accommodate that though....Hmmmm. Jim is great about user feedback, and I sense the design is still very much in flux.... so fingers crossed for more CV channels. I mean between my er-301, qu-bits range, e370, etc quad is the trend now. this thing.. can't wait to check it out. This combined with a Teletype could do mind bending things. You mentioned 8 trigger outputs on the back. Presumably you have some expander modules planned to bring these out to the front. DIY-able ? Yes, and Yes -- You'll just need a panel w/ 8 jacks, appropriate wiring, etc. I don't have a final schematic yet, but the full expander will include more CV as well. Do you plan to include a DrumSeq-type part within Vector's firmware ? Yes! -- The UI isn't quite as natural for quick pattern programming as the launchpad, but I've been doing it w/ just gate control on a few tiptop drum modules, so it will be sort of the same thing, just 8 per sequence. Yeah, everytime I fire up Numerology it gets my excited for this. Wish he would go full monty and do a standalone unit (ala the Cirklon). Even still, this is an instant buy for me. - Dropped one trigger jack, made the 3 remaining jacks bi-directional. - Dropped the 3.5 mm TRS MIDI In Jack. - The unit is 42 hp wide. - It is quite shallow -- approx 25mm (including power pins, but not the connector). - I don't have an exact number on power consumption, but with 2 OLED displays, power draw from the +12V rail will be on the high side. For comparison: The ER301 Sound Computer has a similar display setup and (according to modulargrid.net) draws up to 300mA on +12V rail. Also, the Vector Sequencer will have a USB A jack, which must provide power to whatever is connected to it. - The module only draws power from the +12V and -12V rails — it does not use the +5V rail at all. Price-wise, I reported "Around 700US" at NAMM. I will not know for sure until I have a quote for the front panel and a few other items, but I expect the final retail price to be somewhere between 700 and 800, with early buyers getting a small discount. The first production round will be allocated primarily to pre-sales, with dealer availability soon after that. - The OLED displays now have custom fonts and use double-buffering for smoother updates. - The firmware now supports 8 independent sequencer parts -- which is the natural maximum for this hardware, based both on the nature of the UI (8 knobs) and the available memory on the CPU. - Each part also has 2 sub-sequencers, with parameter modulation. - The SD card now works for storing/loading project files and preferences. - The USB B jack has been tested both for class-compliant MIDI and MSC (mass-storage) operation, but has not been fully integrated into the sequencing functions for MIDI I/O. - Output routing for both CV and MIDI outputs is now assignable. - Prefs : there's now a proper preferences section for global settings like tempo, key, scale, etc. - There's a new sequencing section: Chance Ops. - There have been a slew of internal changes related to how the sequencer code interacts with the hardware (buttons, encoders etc.). All of which is very important to implement, but not very exicting to list here. Ditto for a number of decisions regarding parts and assembly -- not very exicting to report (I'm using knobs from Selco), but still both important and somewhat time intensive. - A new, much more accurate 2-channel Pitch DAC. - The 3.5 mm TRS MIDI In jack has been replaced with a USB A jack. - The two sets of uni-directional Run/Clock trigger jacks have been replaced with 3 bi-directional jacks for Run, Clock and Reset. - The per-step LEDs have been moved about 2 mm closer to the OLED displays for better visiblity when the module is mounted in a skiff. - The buttons in the 'keyboard' (below the main encoders) have been simplified a bit, and now support one full octave (12 semitones). - What was initially a 'trigger expander' connection with 8 triggers has been massively expanded to include 4 sets of Pitch, Gate and Velocity outs, 8 triggers, MIDI I/O (on DIN jacks) and DIN Sync I/O. These inputs/outputs will be made available on a separate 12hp module. The the Vector Sequencer supports 8 independent parts. Each part includes a flexible note-based step sequencer and two CV-based sub-sequencers. 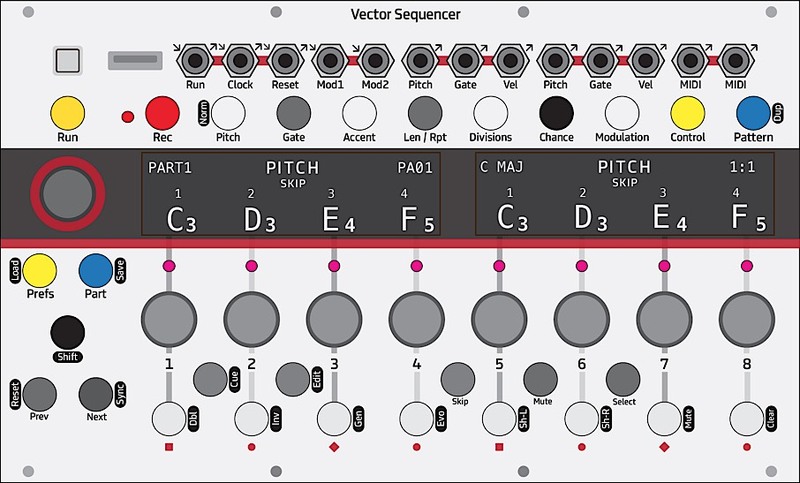 The note sequencer generates pitch, gate, and velocity values that can be output as CV or MIDI. The plan is to support polyphonic parts both for drum programming and for chords, but that has not been implemented yet. In both cases, those alternate modes would only be supported on one or two parts -- i.e. part 7 could be set to chord mode, part 8 to drums. The current sequence length is 16 steps, which will be extended to at least 32 steps, possibly 64. - Select : You can select multiple steps, then use the 9th encoder to edit all those steps at once. - Four different rate modes: Musical divisions, Beat Percent, Speed, Fractional Rates from 1/1 to 16/16. - Hard Sync (reset the sequence every N beats). - Direction controls: Fwd, Bwd, Two pendulum modes, and Random. - Octave and Semitone offset controls. This is a big expansion of the Probability and Random Jump functions in Numerology's Note Sequencers. Here you can pick one chance operation for each sequencer step, and a probability that the operation will occur. - Jump : Backwards, Forwards, Any Direction, or any of the first 16 steps. - Pitch : Up, Down, Any, Or a specific semitone -- all to a max range of +/- an octave. There is also a 'bar' setting that can be used to limit the chance op to certain bars: even, odd, 3rd, 4th and 8th. This option very handy for setting up drum fills. button on the keyboard, clears the entire sequence. Other operations will be added as noted on the latest front panel mockup. - 4 complete sets of CV outputs for Pitch, Gate and Velocity. - Two MIDI outputs with 5-pin DIN jacks. - A switchable DIN Sync In/Out. This 12 hp expansion module is currently in the design phase. It's outputs would have the same flexible routing options as the onboard I/O. There is a preferences section for setting global parameters (tempo, swing, sync, etc), editing part names and setting up signal routings for the outputs. Each sequencer has access to 20 pattern locations per bank. There is room for two banks in memory at once. The number of available pattern locations per bank would drop with longer sequences. Each pattern stores all settings associated with a sequence, including chance operation and the sub-sequencers. There is a grid-based Pattern page where all the patterns for a single Part can be seen and triggered. Patterns can be easily duplicated (Shift+Pattern) into an empty pattern slot. There is a Scene mode, which also has a grid-based UI. This mode displays the current patterns for all parts at once -- each Part gets a column. There are 30 scene locations, which store the chosen pattern for each part, and the mute status of that part. A project file stores all of the preferences, scene and pattern banks for all parts into a single file on the SD Card. Of the big items not yet done, here is a list of the most important ‘must have’ items. - Finish 'bringing up' and testing the REV 2 hardware. - Finish the design of the expansion board, and verify a prototype works properly with the sequencer. - Finalize and order a proper front panel. - Finish the USB implementation (host and device modes). - Sync In and Out (both DIN and MIDI). - Implement "Bank B" pattern presets. - A number of miscellanous features related to sequencing, sequence recording, modulation and so on. Ah ok. All wishes I had have been granted, at least with the expander. So one of these plus expander + my er-301 will make a great 84hp row!! so great. it's like a nice slice of numerology in hardware. This looks really nice, will hold off any opinion till Jim gets Polyphonic & Drum sequencing ready, but following the Kilpatrick Carbon release, I will say it looks like a pattern generator, rather than a full scale sequencer. no harm with that, but some online expectations might get loud. So many great modules, so little space left in case..